Playful City USA Resources | KaBOOM! Watch to learn more about the benefits of Playful City USA and the application requirements. The webinar also features Wendy Rubin, Parks and Recreation Director from six-time Playful City USA community Coventry, Conn., who joins our discussion on how a Playful City USA designation helps to make your community even more playful. In municipalities across America, engaged citizens and civic leaders are actively seeking innovative ways to improve the accessibility, quality, and quantity of play and play spaces for children. To help cities build awareness and political capital and develop a policy on play, KaBOOM! 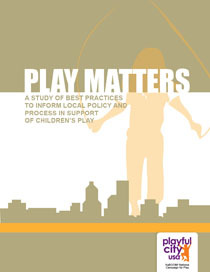 identified 12 relevant and innovative best practices in play.